What's the surest way to your love's heart this Valentine's Day? Irresistible food of course! With February 14th just around the corner, we're brining you 14% off site-wide now through Sunday (with the code FEB14OFF). So plan out the perfect menu for you and your sweetie and then grab the delicious Blenheim Apricot flavors that you need. 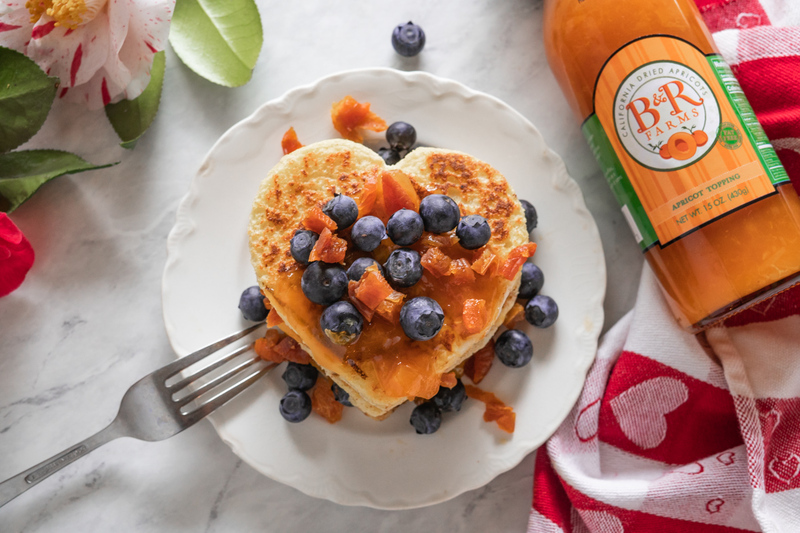 If you're looking for some inspiration, we've lined up Blenheim Apricot infused Valentine's Day recipes for each meal of the day - even one for the kids! We put our whole heart into each recipe with the hope that February 14th will bring you hugs, kisses, and all your Valentine's day wishes! Start the day off with a plate that says, I love you! Whip up your favorite French Toast recipe, but before you dip the bread, use a cookie cutter (like these!) to make heart shaped slices. Once cooked, load your heart stack with toppings you adore, like B & R Farms Diced Dried Apricots and Apricot Topping. Sometimes, the best Valentines are your little ones and on such a special day, ordinary PB&J simply won’t do. Swap out your usual jelly for our Apricot Preserves and you’ll be sure to get big hugs from sticky little fingers. Sweet love is in the air with this heart-shaped fruit platter sprinkled with Diced Dried Apricots. Pair it with its perfect match by adding one of these dips on the side. Apricot Fruit Dip With Applesauce: Apricots, oranges, and apples come together for the perfect sweet and creamy dip with this recipe. Sweet & Simple Fruit Dip: Mix cream cheese with B & R Farms Apricot Topping and watch the fruit fly off the tray like it was Cupid. Bring a little heat to your sweet, with this dinner for two (or three or four!). Instead of a round patty, shape your ground meat into hearts before it goes on the grill. Cut your buns into heart shapes too and top it all off with B & R Farms Apricot Chili Preserves. Chocolate is a must-have on Valentine’s Day. If ooey-gooey dessert is your thing, indulge with our decadent Apricot Brownies recipe made with Diced Dried Apricots. You’re never too old for a mother’s love – right, Brian? Cap off Valentine’s Day with an apricot infused cocktail. Add a splash of Vodka to B & R Farms Frozen Apricot Puree, seltzer, and cranberry juice and cheers to love with family and friends! Wishing all of our customers and partners a very happy Valentine’s Day!